If we let f(x)=3x³-0.5x²-0.5x-1, in order to solve this equation and determine its roots, it is necessary for it to be written in the form 3x³-0.5x²-0.5x-1=0. 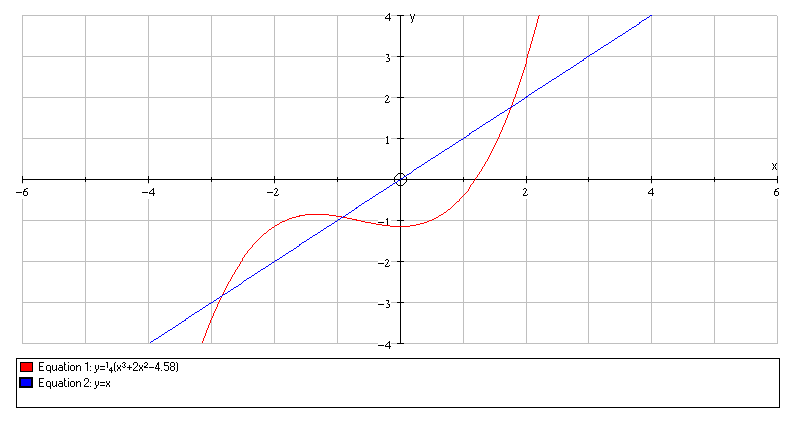 The root of the equation f(x)=0 is indicated where y=f(x) crosses the x-axis. 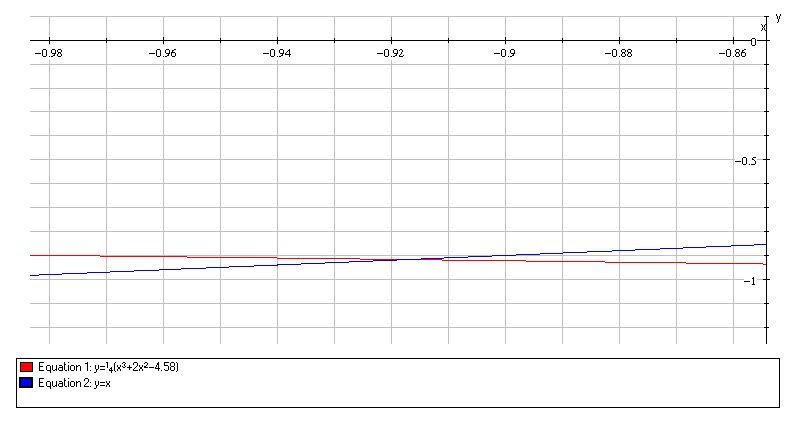 Roots of the equation 3x³-0.5x²-0.5x-1=0, will be found to a three decimal place accuracy. 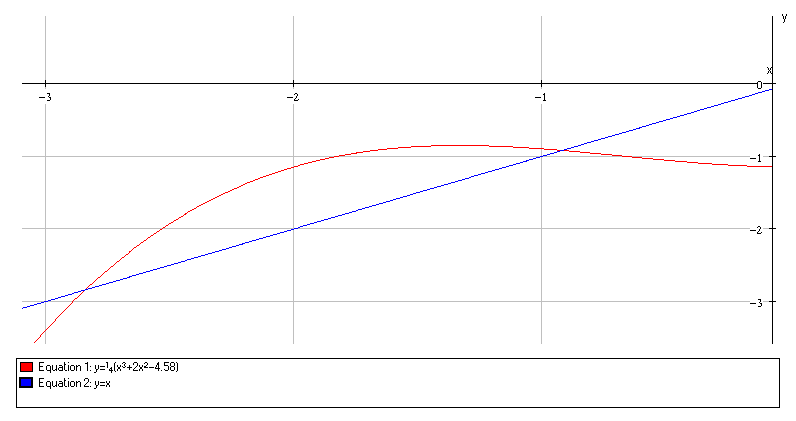 Having illustrated the equation graphically using Autograph, it is evident that the equation has only root that lies between the interval [0,1]. 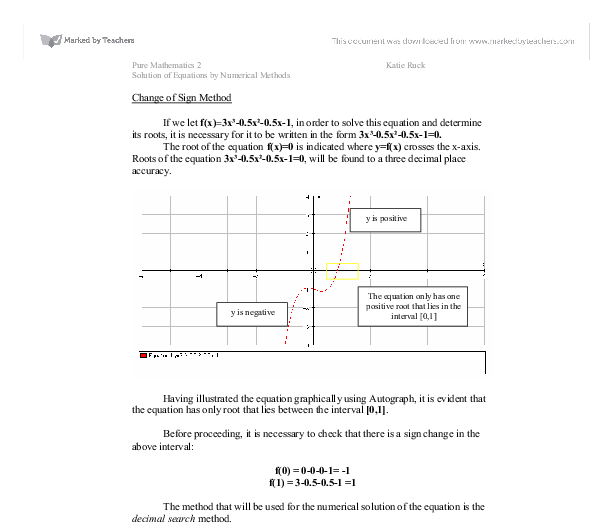 The method that will be used for the numerical solution of the equation is the decimal search method. 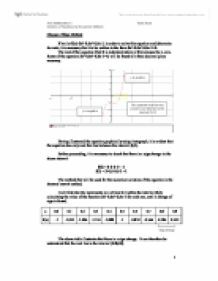 I will first take the increments in x of size 0.1 within the interval [0,1], calculating the value of the function 3x³-0.5x²-0.5x-1 for each one, until a change of sign is found. The above table illustrates that there is a sign change. It can therefore be understood that the root lies in the interval [0.8,0.9]. Having narrowed down the interval, I will continue with the decimal search, but now using increments of 0.01 within the interval [0.8,0.9]. This indicates that the root lies in the new interval [0.83,0.84]. I will continue the process using the increments of 0.001 within the interval [0.83,0.84]. The root therefore lies in the interval [0.838,0.839]. I shall now use increments of 0.0001 in the interval [0.838,0.839]. Therefore the root lies between 0.8389 and 0.8390. To three decimal places, the root = 0.839. A change of sign method such as the one used, provides bounds within which a root lies so that the maximum possible error in a result is known. The error bounds of the root 0.839 are 0.839 ± 0.0005. However, I am able to say that I have a more accurate solution, as I know that the root lies in the interval [0.8389,0.8390]. There are a number of situations that can cause problems for change of sign methods. For example, let y=f(x)=x³-2x²-x+2.63. This curve is shown graphically below. With this example I shall use the decimal search method to find a change of sign and so investigate the roots of the previous equation. Integers will be used as the x-values. 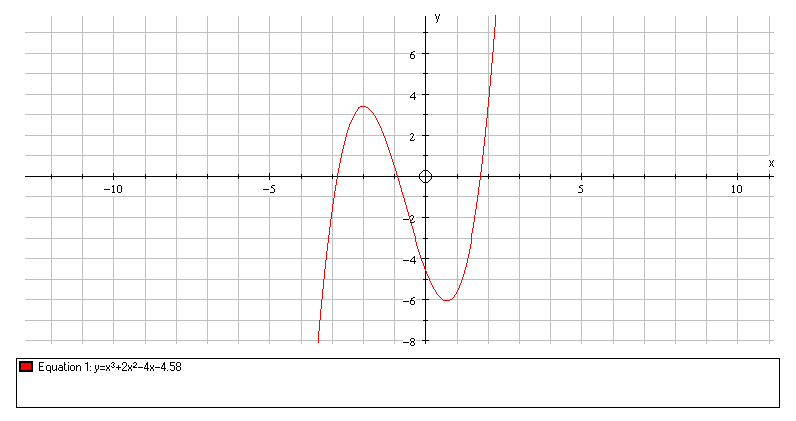 From the graph it is evident that the equation x³-2x²-x+2.63=0 has more than one root, i.e. roots that lie in the intervals [-2,-1] and [1,2]. However, the above table illustrates that the method used only detects one such root that lies in the interval [-2,-1]. In this case, using the method of decimal search has caused an incorrect conclusion to be reached. This is because the curve touches the x-axis between x=1 and x=2, therefore there is no change of sign and consequently all change of sign methods are doomed to failure. The roots of the equation can be found where f(x)=0. 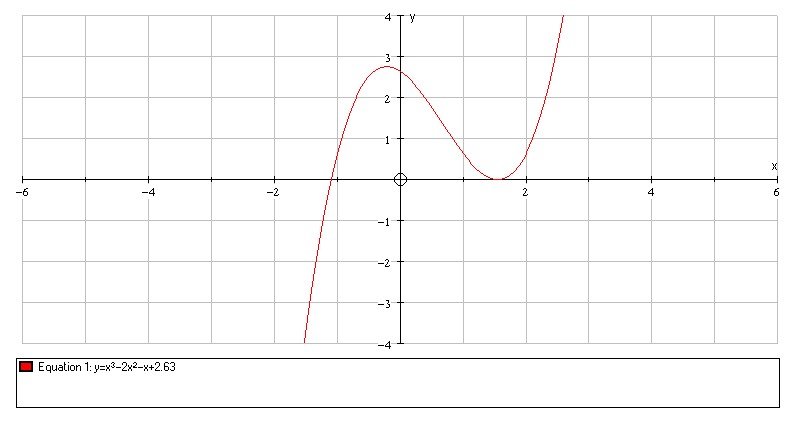 From the graph, it is evident that the roots of the equation lie in the intervals [-3,-2],[-1,0] and [1,2]. x0=-1 into the iterative formula to find the value of x. A line is drawn from x0to equation 1, and then ‘followed across’ to the closest point on equation 2. Repeating the former process will cause the values where the line meets each of the two equations to come closer together until they converge at the point where the two curves intersect, and therefore at a root. The iterative formula calculates these values as they converge. The following table was obtained using a Microsoft Excel spreadsheet, with the formulae shown. The sequence works using this particular iterative formula because when the gradient of y=g(x) is less that 1, y=x is used as a ‘barrier’ and makes the sequence converge thus allowing the root to be found. Therefore the root to the equation between the interval [-1,0] is –0.9172560 correct to seven decimal places. The above calculations illustrate that there is a change of sign. Therefore the root is -0.9172560±0.00000005. I will now attempt to find the root that lies in the interval [1,2] of the same equation. As before, the Fixed Point Iteration method will be applied. My chosen starting value, x0, will be 2. The equation has already been solved to find the root that lies in the interval [-1,0] using this method. The following steps show how this was done. If y=f(x)=x3+2x2-4x-4.58 then the roots of the equation can be found where f(x)=0. It is first necessary to look for a sign change between integer values so as to choose a suitable starting value. The fact that this value is less than 1, tells us that the chosen value of x0 will lead to a root of the equation. The following table was obtained using a Microsoft Excel spreadsheet, with the formulae shown. Therefore the root to the equation between the interval [-1,0] is –0.917 correct to three decimal places. The error bounds of the root –0.917 are –0.917 ± 0.0005. The table below shows part of the formulas used in the Excel. A f(a) b f(b) c f( c) 0 =0.2*(A2-4)*(A2+2)*(2*A2-1)+1 1 =0.2*(C2-4)*(C2+2)*(2*C2-1)+1 =(A2+C2)/2 =0.2*(E2-4)*(E2+2)*(2*E2-1)+1 =IF(F2>0,E2,A2) =0.2*(A3-4)*(A3+2)*(2*A3-1)+1 =IF(F2<0,E2,C2) =0.2*(C3-4)*(C3+2)*(2*C3-1)+1 =(A3+C3)/2 =0.2*(E3-4)*(E3+2)*(2*E3-1)+1 =IF(F3>0,E3,A3) =0.2*(A4-4)*(A4+2)*(2*A4-1)+1 =IF(F3<0,E3,C3) =0.2*(C4-4)*(C4+2)*(2*C4-1)+1 =(A4+C4)/2 =0.2*(E4-4)*(E4+2)*(2*E4-1)+1 Failure in this method This method cannot always be applied to every equation successfully. If my prediction is correct, my calculations above have found a wrong root (the blue arrow), which is not the root I want (the green arrow). The Decimal Search method has failed to find the root that I want from 5x^4+x�-2x�-0.1x+0.1=0. This is because in the equation, it has an intercept of 1. x Gradient 2 4.5 -1 3 4 4.25 -3 3.67 Results: In this graph, the gradients at these points alter. The -1 on the x axis has a gradient of 3. 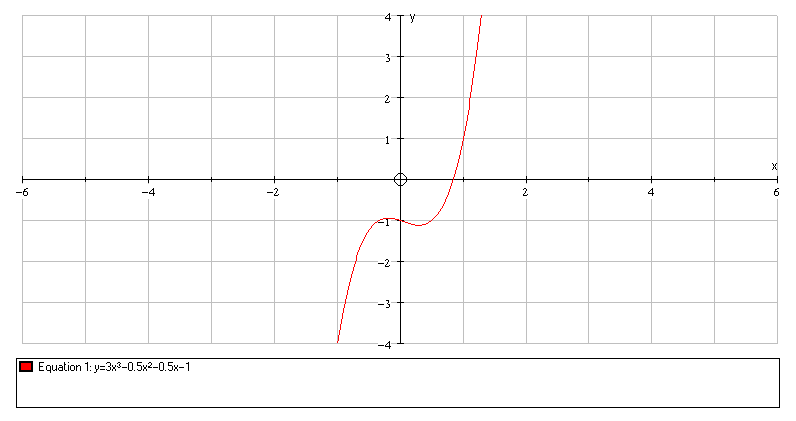 Limitations of Decimal Search The decimal search, an example of a change of sign method, will not work when the curve of a given function touches, but does not cross, the x-axis. In such a case there is no change of sign, and so the method is doomed to failure. Fixed point iteration: An approximation of the root can be calculated via this method. An equation can have more than one root, in order to find both roots we have to rearrange the equation so it equals x and use fixed point iteration for both equations.